This is delicious, delicious, delicious! Turned out better than I imagined. You could probably get someone to love you just by giving them this. * Yes, it really is that good! Prep. time: 25 minutes. Cost: Less than $10. Serves: 6 big mugs. Add sugar and 1/2 cup water to a medium saucepan. Stir. Bring it to a boil over medium heat. Let it boil, without stirring it, until it’s a dark amber color. Be very careful not to burn it. You may need to move the pan around (if you’re using a gas stove) so that the flame isn’t always heating the exact same spot & thus burning part of it. It took me 17 minutes to get it to a dark amber color. It may take you more or less time. Remove pan from heat and slowly & carefully (the hot sugar will splatter) add the heavy cream steadily while whisking fast and consistently. You might need two people to do this (I did) ~ one of you whisking, the other pouring in the cream. If you don’t whisk fast enough, it’ll clump. No worries, just add all the cream then put the pan over low heat, stirring the whole time, until it’s smooth and creamy again. Add the caramelized sugar you just made from the above steps to the Crock-Pot. Add coffee, sea salt, vanilla, and milk to the Crock-Pot. Stir then ladle into mugs (refrigerate any leftover). Be careful, it’ll be very hot. *Love potion results not guaranteed. **I like it salty. If you don’t, use less salt. 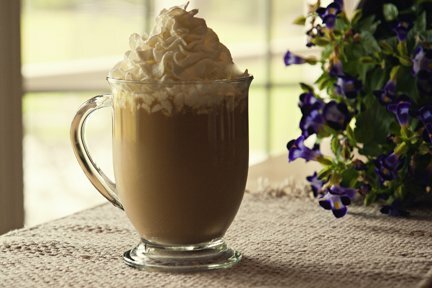 4 Responses to "Salted Caramel Latte Love Potion*"
How have you been, Shelli? Life treating you alright? Hope so. You take care and keep smiling, ok? LOL, yeah it’s got a lot of milk in it. I haven’t tried it with a different kind of milk (soy or that Lactaid), but you might want to give that a shot. I’ve been excellent, thanks. I’m on track with this novel I’m working on so that makes me happy. 🙂 How’s life by you? Hope great! Let me know if the love potion works for you since you snatched it (that made me laugh). Cheers, my friend. Life’s busy. Last week all I got was Sunday off. *sad face* As long as I get this weekend off I don’t care what I do, but now that California is cooling off, I’m looking forward to time on my back patio again. Best of luck w/ your WIP. Will there be a media blitz when it’s ready? Keep me in mind. Perhaps I can help w/ that.